Earlier this year I made a conscious decision to start eating cleaner. We already had a pretty clean diet when it comes to meals or major food groups, but I am guilty of being a snacker throughout the day, and have passed that habit down to my kids. We tend to graze all day long, and I realized that is where I became a little loose on the "clean" portion of our eating. Liquids were also my down fall. I am not a coffee drinker, so I relied on sodas for my caffeine fix each day (I know, big no no.) As a tired mom, I found myself drinking more and more, or grabbing an energy drink for a boost. In February, I went cold turkey and started to drink just water, sparkling water, and the occasional glass or two of wine (obviously). I took a step back to reassess our pantry over the summer to see where I can minimize our processed food intake. It's been a gradual process, but along the way I've seen so many positive results that I know the decision was a good one. Now this isn't to say we are 100%, but enough that I think makes sense for our family. I've noticed some huge differences personally. As soon as I gave up snacking on processed foods and refined sugars, my skin started to feel better. I noticed it was smoother and the tone was much clearer. Mr. Cute joined me at the end of the summer and his results are so impressive! Once he began eating cleaner he lost about 10lbs right off the bat, and another 5lbs since then. He also gets a lot less headaches and migraines. He was good for at least one huge migraine a month and since he started eating clean, he's only had one headache that was even somewhat bothersome. I also noticed everyone's mood seems better towards the afternoon - when we are typically snacking. Mr. Cute and I have both noted we have more energy. I've noticed changes in the kids moods too. They tend to have less after school meltdowns than they did before. Don't get me wrong - they still occur, just less frequently. It's been such an eye opening and rewarding journey so far for our little family. One that I hope we continue down to help create life changing habits for both us and our kids. Looking back on it, it wasn't as hard as a process as I thought it would be. Here are some easy tips I've learned to make eating clean an easy transition. The best way to try start eating clean is to become knowledgable about what eating clean is. Basically it means to eat "real" food and cut out all foods that contained processed ingredients and refined sugars. To eat clean you want to get your food to be made as close to their natural state as possible. It's amazing how difficult some food labels are to understand, not to mention how many bad for you ingredients they contain. Which brings me to my first tip. If you read an ingredient, and have no clue what it means, the majority of the time it is a processed food. The goal is to be able to look at a food label and understand clearly what each ingredient is. Anything that is unpronounceable or contains more than 20 unidentifiable ingredients is probably on the "no-no" list. Now that you have become familiar with your food labels, and know what to look for, start going through your pantry and refrigerator. Read the labels and identify what isn't as good for you as what you thought. Now this is where I began to hesitate slightly in my clean eating quest. I began to realize just how many foods in my pantry weren't as healthy as I thought. These were typically my snack foods. I didn't want to waste a bunch of food by throwing it away, so I made a note of what we could re-buy and what we should probably leave off the list the next time we visited the grocery store. I felt like this made for a much more gradual transition to our eating habits, and didn't make it feel like it was such a shock for the kids when some of their snacks were suddenly gone. Now obviously we didn't stop snacking all together. Old habits die hard. What I did do when I did my little pantry refresh was swap out some of our favorite snacks for some new favorite "cleaner" snacks. I did some research - and a lot of taste testing - to find some new yummy snacks so that it didn't feel like we were giving up anything. Plus we are still a busy family, and I need to have a few snack options on hand that I can just grab, throw in my purse or diaper bag, and go. 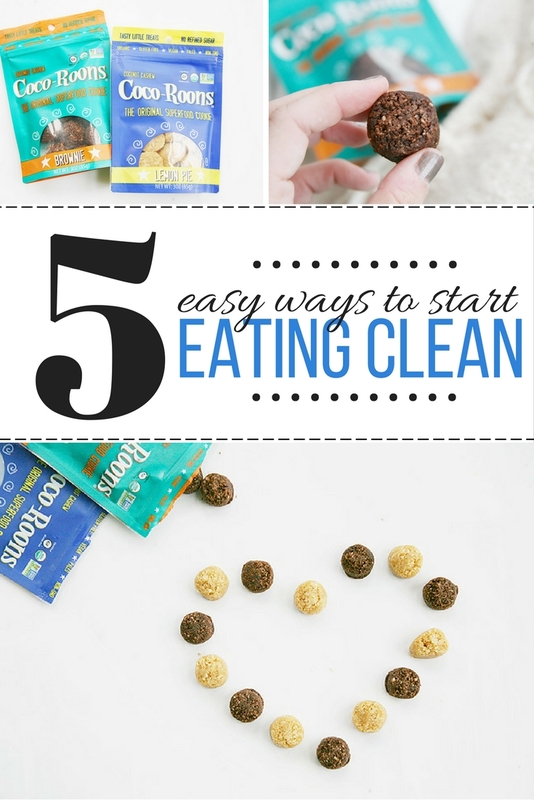 I was nervous that eating cleaner meant that I wouldn't be able to find snacks that I can just grab quickly out of the pantry and that I would have to pre-make a lot of refrigerated food and carry around a cooler. Luckily that wasn't the case! I was able to easily replace some of our grab and go snacks with some amazing tasting new cleaner ones. 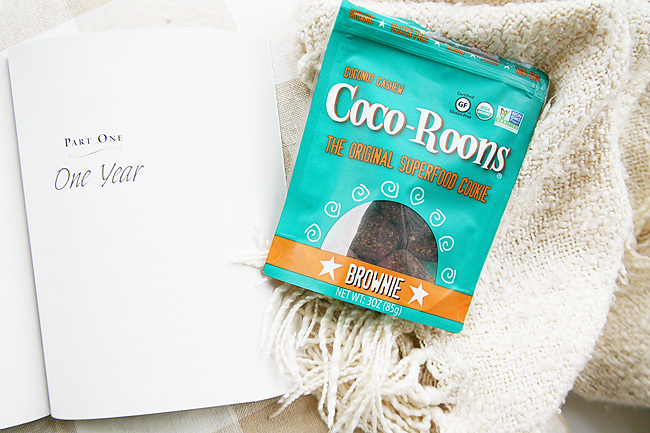 One of our family favorites are these Sejoyia Coco-Roons. We are not only guilty of snacking, but my family also has a major case of sweet tooth. I was so excited when I found these yummy cookies while browsing the gluten free aisle of Walmart grocery shopping a few weeks ago. I checked the ingredients and was thrilled to see that are made with only a handful of real ingredients (that I can pronounce! ), are non-GMO, and are naturally sweetened with pure, organic maple syrup or coconut instead of a ton of sugar or sugar alternatives. Healthy cookies - we're in! 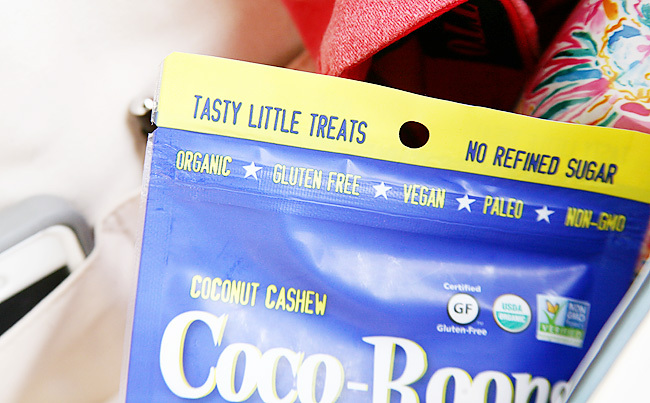 Bonus if you are looking to eat gluten free, vegan, or paleo they are also approved. 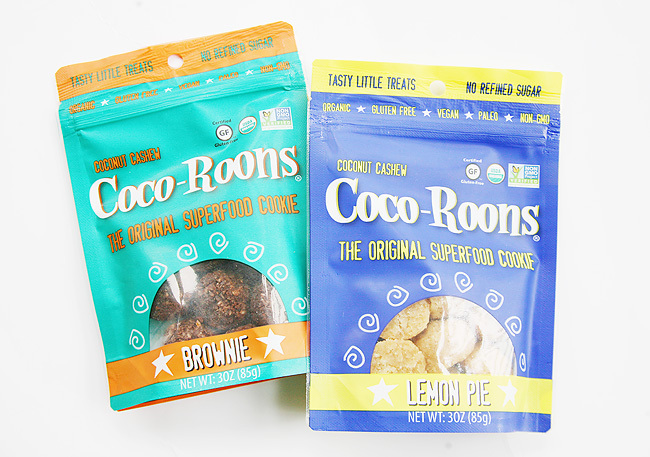 There are several flavors of Coco-Roons available, but we came home with the Brownie flavor and the Lemon Pie flavor. The kids like the brownie flavor better because chocolate. I tend to go back and forth. My go-to during the day is the Lemon. I like that it's a little lighter and more refreshing tasting, especially since I reach for them throughout my day! At night when I settle down for a little treat and a little me time, I tend to go for the Brownie. Because chocolate. Both overall have passed the family taste test. I'm excited that I have something easy, quick, and healthy to snack on with my family that fits in with our busy lifestyle. 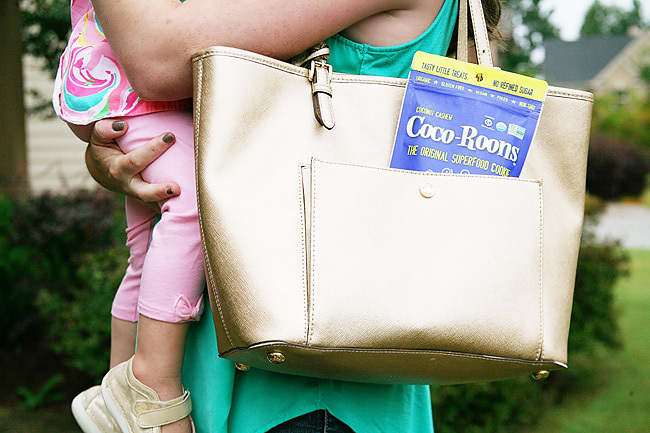 Now that I've found some snacks like Coco-Roons, I make sure to always have some on hand with me. 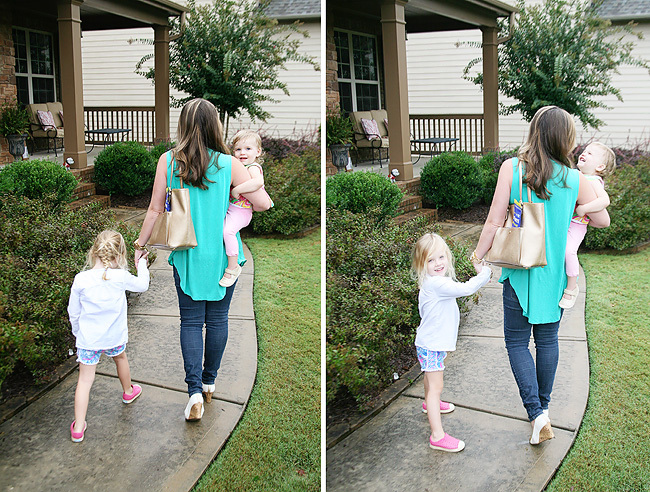 One key ingredient to parenting survival is to always have snacks on hand. Well, that doesn't change when you decide to eat a cleaner diet. 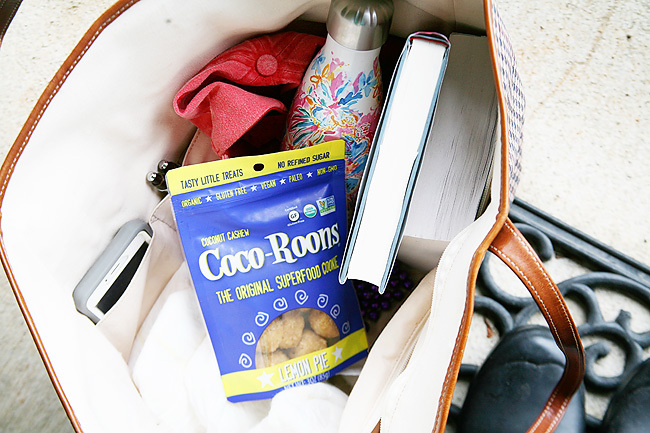 No matter where we go, I always make sure to pack in my bag a few extra snacks. And then I throw in some more for good measure. I've realized that as we transitioned to eating cleaner I had to be a little more vigilant about always having a snack with me because if I ran low I realized sometimes I couldn't purchase something on the fly when we are out and about as I was able to before. Snack machines and certain play places tend not to offer clean options. 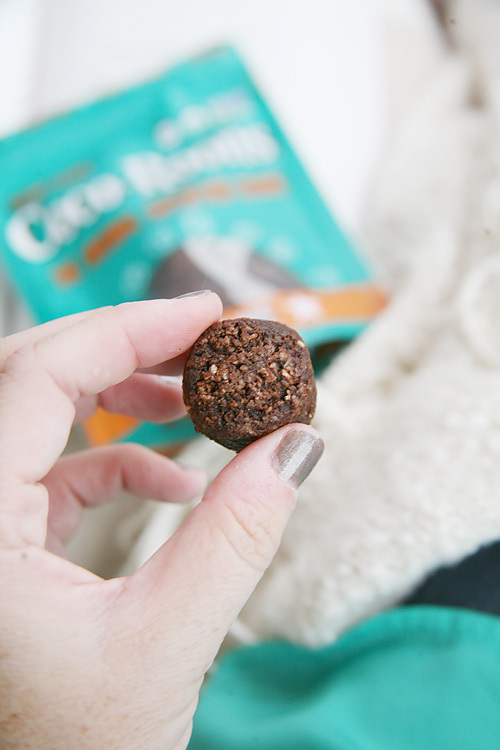 So I always make sure to have back-ups snacks, like Coco-Roons that are easily packaged and don't require any refrigeration, stashed in my car, gym bag, or diaper bag. This one was my biggest toughie to accomplish, but cooking at home has slowly become easier in our daily routine. We used to eat out a ton, and it's so simple when you have a crazy day to order take out and not worry about all the fuss of making dinner. However, it's hard to eat clean when you eat out. Unless a restaurant clearly states they cook with organic, whole food ingredients more than likely your whole eating routine is blown in one meal. Fast food...not even an option. After a few hiccups, and some strategic planning with Mr. Cute, we've figured out a system that works for us and now we don't stress as much about meal planning. We tend to use Sunday to do a lot of meal prep for the remainder of the week, and thankfully the food angels grace us with their culinary slow cooker skills via Pinterest or else this might have deterred me from the whole process. In reality, cooking clean meals at home was easier than making any sort of other dinner. Especially once we had tip numbers one, two, and three down, meal times just became sort of an after thought rather than a stressful thought. Overall eating clean is a lifestyle change, and one with a variety of benefits. Slowly incorporating these little tips and tricks into our lifestyle has made the change feel less overwhelming, and now we don't even think about the changes because now they are our natural habits. Do you have any tips or tricks to incorporating clean eating into your daily routine? Do you have a favorite meal or snack? Please share! I am always looking for new things to add! Great blog post :) We're so glad you love Coco-Roons and that you've noticed some personal changes in your health. Thank you! 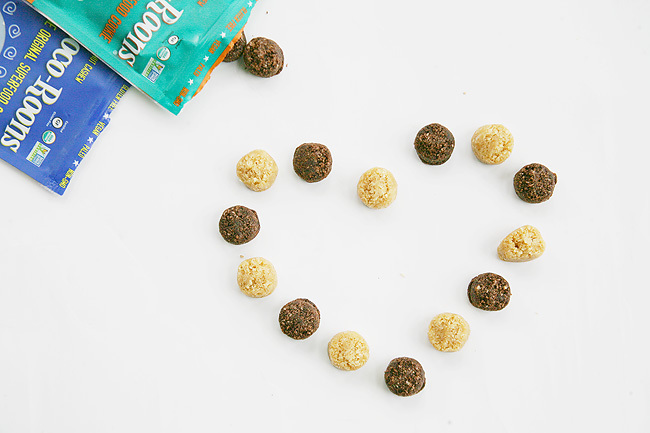 They are our favorite go to snack all day long!